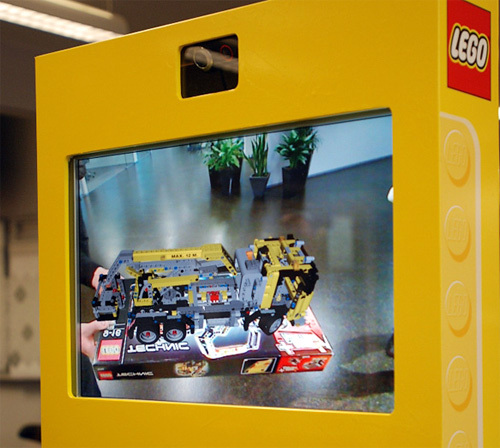 LEGO's Digital Box Kiosks Use Augmented Reality To Bring The Models To Life | OhGizmo! I’m not sure how this one slipped through the cracks, particularly since it was announced back in December of last year, but LEGO will apparently be rolling out these new ‘Digital Box’ kiosks to select toyshops around the world that allow you to see a 3D representation of what the LEGO model looks like when fully assembled. The kiosk uses a built-in video camera and custom augmented reality software developed by a German company called Metaio, and because the model exists in 3D, you’re able to interactively turn and move it around to see it from all sides. Now I can’t say I’ve ever had any trouble with LEGO misrepresenting what the final product looks like on their packaging, but being able to see a 3D model in the store can only help boost the anticipation of tearing that box open when you get home. Or, if there’s a particular model on store shelves that you’ve been trying to build using your existing LEGO stock, this could make it a lot easier to reverse-engineer how it was constructed.